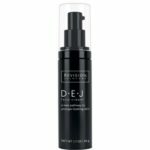 D·E·J face cream™ is a new pathway to younger-looking skin. 97% of subjects showed an improvement in smoothness, brightness and wrinkles*. Provides intense moisturization for smoother skin texture.